The new high end intel chipset is the 925X. It supports only socket 775 Pentium 4 processors, and runs them at 800 MHz (or 533MHz) FSB for 8.4GB/s bandwidth. While the 915 can be used with ether DDR or DDR-2 memory, the 925X is a little more picky. 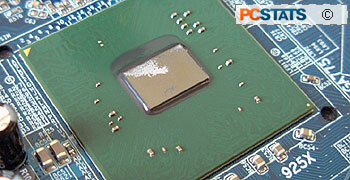 It operates with DDR2 (ECC or regular) memory exclusively, in dual channel mode at 8.5GB/s bandwidth. The 925X also says "bye bye" to the AGP slot entirely, meaning you will have to have a PCI Express x16 videocard. Up to four PCI Express x1 slots can be built into the motherboard for peripheral expansion, but unlike the PCI-E x16 slot they run through the ICH6R southbridge at 500MB/s bandwidth. On the Gigabyte GA-8ANXP-D there are three physical PCI-E x1 slots, and one virtual one used by the Broadcom Gigabit Network adaptor. Like the i875P before it, the 925X has an optimized memory controller to differentiate its performance from the mainstream 915 chipset. Intel is very tight lipped about exactly what its done, hoping perhaps to prevent motherboard manufacturers from creating another 865PE + PAT situation. The DDR2 memory controller built into the 925X provide 8.5GB/s of bandwidth while the PCI Express 16x bus can pump out 8GB/s of data, almost four times that of 8x AGP! Between the 925x and the ICH6 southbridge is a fat 2GB/s pipe which should be more than enough for the demanding user. We all agree that the Intel ICH5 southbridge was a huge improvement over ICH4, and now ICH6 adds a little more into the mix. First off, ICH6 natively supports four Serial ATA ports, up from two found with the ICH5. However as a trade off, the ICH6 has just one IDE channel. We'll all have to get used to saying good bye to our IDE hard drives now... For expansion needs, the ICH6 supports up to four PCI Express x1 slots, or six regular PCI slots. With IDE quickly going the way of low gas prices, Serial ATA devices are where it's at. Being that IDE RAID was a very popular selling point of many motherboards, it would be a tragedy if consumers were shuffled back to the days before RAID with SATA. This isn't the case, thankfully. The Intel ICH6R variant which is what we find on the Gigabyte GA-8ANXP-D, supports RAID, which Intel supports through what it calls its "Storage Matrix Technology." Intel has always been clever with catchy names. The RAID feature is only found in ICH6R southbridges, and it supports RAID modes 0, 1 and 0+1. Now, let's see what the GA-8ANXP-D can do for us in the way of overclocking! By now I'm sure you've heard a rumor about Intel locking out overclockers. Whether this is true or not I'm not sure, but PC Ekspert say the problem lays with the 915P/925X chipsets not receiving enough voltage to clock higher. I'm still not sure if that's 100% correct even after playing around with the Gigabyte GA-8ANXP-D. In any event, overclocking a 925X based motherboard starts at the default FSB of 200 MHz. From there the board was pushed up towards 216 MHz FSB. The system would not POST at 217MHz, which is strange because it was 100% Prime95 stable at 216MHz without any voltage increases. Past experiences have always shown us that even if a system is unstable, it should be able to POST at higher speeds. We'll be investigating this situation a bit more closely once we get a few more 925X motherboards into the PCstats labs.